Sometimes you come across a book where you find some remarkable explanations, some fine scenes written, interesting dialogs are there, and overall, the story also has the potential, and despite that, it doesn’t satisfy your expectations as a reader. 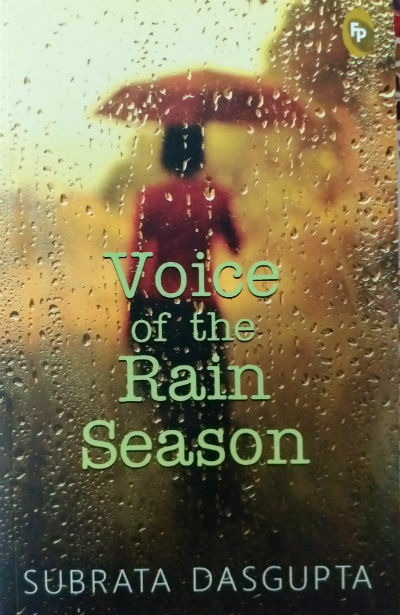 Recently I came across a book named Voice of The Rain Season (provided by Fingerprint Publishing) penned by Subrata Dasgupta, and I personally feel that it falls in the above mentioned category. Let us take a look at the book’s cover page. The book starts with the description of intimate moments between Joya and Martin. Eventually, we are introduced with many characters, but they remain the protagonists for the most part of the story. We are then introduced to Hari Lall and his life. And, the story then goes into past and moves ahead in threaded environment, where threads of past are getting explored along with the present. And the story refers up to 4 generations to let the reader connect the dots. Along with the story, we are getting detailed information about various cultures (mainly Bengali culture from India, and US culture) and how they crosses over. And yes, there are references to food, way of living and mainly, literature of various cultures. The author himself was born into Kolkata (then Calcutta), India, then lived in England, Canada and USA. And some of the authentic exploration of various stuff belonging to each of these countries is available throughout the book. The way the protagonists are introduced and the moments they are sharing, are quite out of the place. While it is quite ok, and in some cases even considered as obvious, for the readers under the influence of the way of living in western countries, I am not sure if it goes well with the target readers a well. If we have to take a note of the positive attributes of the book, then we must put the “literature of various cultures” explored in this book at the first place. As it is said, Bengalis are fond of literature, sweet, and music among the other things, the author proves it. The author himself seems a well read soul, the way he refers various books, authors and influence of the same on various characters and incidents is quite interesting. Also, the author is good at exploring the cultural cross-overs. He leaves no place where he can compare the things from various different cultures. The music of the land is explored well. Also, there are strong female characters accompanying their male counterparts. There are some lines written quite nicely and they are very realistic too. For example, you can find the following paragraph in the beginning of the book, which is absolutely taken from the reality (as author is a teacher himself). In every class, one or two students make their presence felt on the very first day. Sometimes it’s because of how they look, sometimes for how they dress, sometimes for what they say. Sometimes it is by virtue of a certain demeanour or an acuteness of gaze. And more often than not, the teacher’s initial impress is borne out in the course of the class: the student turns out to be the sharpest or the most articulate, the one who asks the most interesting or vexing questions. He or she is the one who adds life to the classroom, who makes the teacher feel that teaching is worthwhile after all. The book, though, starts in slow manner, and the things don’t move so interestingly. Often you may feel that you need to put in efforts to continue reading the story, based on various factors. It is not good for any book. While you love scenes where some characters are delivering speeches, the marriage, and conversation about Bengali literature, you may find many things which are not in sync. Author has put in conscious efforts in mentioning Kolkata-Calcutta stuff, we wish he could have put in similar efforts at a few more places and the pace of the book could have been fast. Personally I didn’t find the book, very much interesting, but if you love to explore various cultures, can adjust with some adult content and you like to explore cultural crossover movies, you may like to read it.